The Future Museum is described by artist Jethro Brice as: “Hailing from some unknown time in the distant future, this roving cabinet of curiosities holds a ramshackle collection of artefacts salvaged from the ancient ruins of 21st century civilisation. The Wunderkammión displays treasures from a forgotten age of affluence, alongside examples of the creative solutions that characterized life in a rapidly changing environment. It presents a spectacular and fascinating archaeology of growth, collapse and survival – and the lessons to be learnt from our turbulent past. 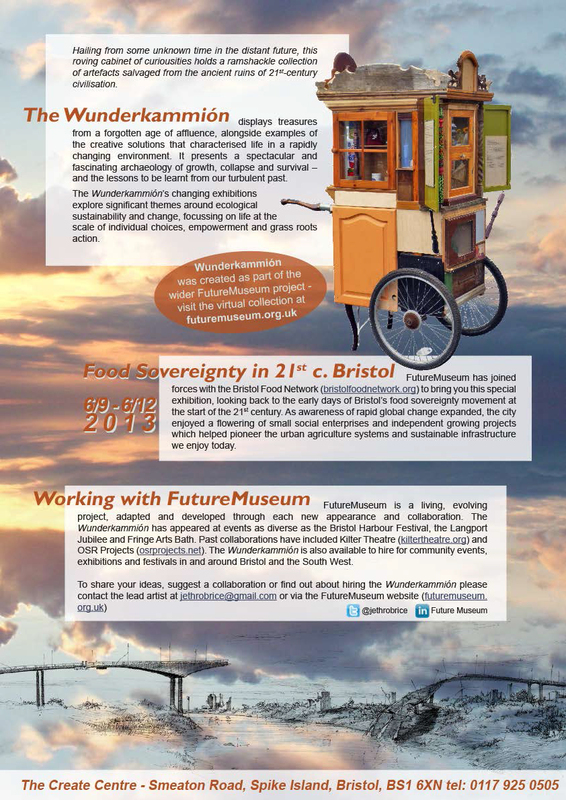 Bristol Food Network collaborated with community artist Jethro Brice to adapt the amazing Wunderkammión to bring “The Future Museum of Bristol Good Food” to Bristol’s Harbour Festival in 2013. Take a look at Jethro’s website http://futuremuseum.wordpress.com/2013/10/07/wunderkammion/ for some lovely photos taken on the day. Download the description of all of the “artifacts” in the exhibit here.